Target audience: Nonprofits, cause and community organizations, foundations, NGOs, businesses, brands, government agencies, conference organizers, educators. Second of two parts. 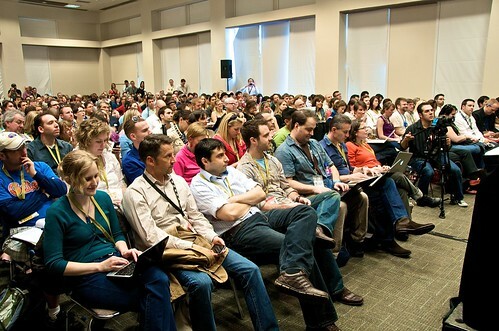 See part 1: 5 ways to use social media to build a crowd for your event. Social media is becoming an indispensable means of promoting any event these days. Think about what are the best channels to reach your target audience: blog, Twitter, Facebook or something else. In part 1 we covered five guiding principles on promoting events, from choosing the proper platform and defining success metrics to inviting friends and stakeholders. Below are five more tips that will make your event a success. 6Create an event hashtag and promote it. Encouraging dialogue with Twitter hashtags is an excellent way to build buzz around an event. However, it’s important to step in and designate what the event hashtag will be as early in the process as possible (if you don’t, others will do it for you and there will most likely end up being multiple ones, diluting the effect). Then publicize the hashtag in advance across all channels — put it on your registration page, website, and use it in every single one of your Twitter posts. Once at the event, plan to promote it repeatedly: in signage, in printed programs, and from the stage. Your goal is to get every tweet about your event to contain your hashtag. The hashtag will aggregate all Twitter conversation around the event and help attendees connect and spread the word. Some events run contests — for example, asking trivia questions on Twitter related to the event topic, and requesting that all responses contain the Twitter hashtag — to get traction for the hashtag early on. TechCrunch50 did a random drawing from all people who tweeted with their hashtag and gave away free tickets to their event. 7Create a Twitter profile. Because Twitter is automatically more public than Facebook (you don’t have to be friends with people for them to see your tweets), using a personal profile to promote your event on Twitter is totally acceptable (as opposed to Facebook where you might not want to do that if you reserve your Facebook profile for more personal communication). In fact, attendees might like to see the face behind the event and connect directly with you as the organizer, and Twitter is perfect for this. Target audience: Nonprofits, cause and community organizations, foundations, NGOs, businesses, brands, government agencies, conference organizers, educators. First of two parts. Also see part 2: Using Twitter & LinkedIn to promote your event. We often get asked, “How can I leverage social media to promote my event?” So we started collecting best practices from event organizers who use Eventbrite and pulled them into this post to help you get started down the path to social media glory. It’s important to note that social media is a clunky gun — it’s a channel, not a strategy. The best way for each event to utilize this channel will vary depending on who the target audience is and how they engage online. It’s no silver bullet. That said, social media can be an incredibly powerful promotional tool, allowing you to reach more of the people who care about and ultimately want to attend your event. When people share information about your event with their network, that message carries much more weight than a traditional ad. It’s a personal endorsement of your event. Social media is also the perfect tool to generate buzz, to get people talking about your event in a recorded fashion where others can stumble across it and get caught up in it, too. It’s not a new phenomenon. That’s how people have promoted their events from the beginning: get people talking about it. What social media brings is the ability for anyone to discover the chatter, giving it far more reach and power. But it can be a game-changer. We’ve built a lot of features into Eventbrite to support sharing of events through social media and we see the results every day. Facebook is the greatest driver of traffic to our site, which means people are sharing your events on Facebook, their friends are seeing the posts show up in their feed, and they are clicking on the links that bring them back to your Eventbrite event page. That’s really exciting, and I hope you can see the powerful implications that it has on the way events are promoted and discovered. Choose the platforms that make sense for your event. 1There are a few options when it comes to promoting your event through social media, and each has advantages and disadvantages. For example, Facebook and LinkedIn show who’s attending and they aggregate conversations about the event in one place, while Twitter provides the opportunity for anyone to discover the event. Building your own social network around your event may be the thing to do if you have an appetite for building a richly branded online experience, but it won’t give you the virality of established social networks. Look to strike a balance across several platforms. Most important, understand where your target audience is already engaging. Identify existing communities by searching on LinkedIn, Facebook, or other forums, monitor Twitter conversation, and locate the platforms that have the most activity. This is where you’ll want to place the majority of your efforts. Define success metrics and don’t underestimate the effort required.